Massive declines in population abundances of marine animals have been documented over century-long time scales. However, analogous loss of spatial extent of habitat-forming organisms is less well known because georeferenced data are rare over long time scales, particularly in subtidal, tropical marine regions. 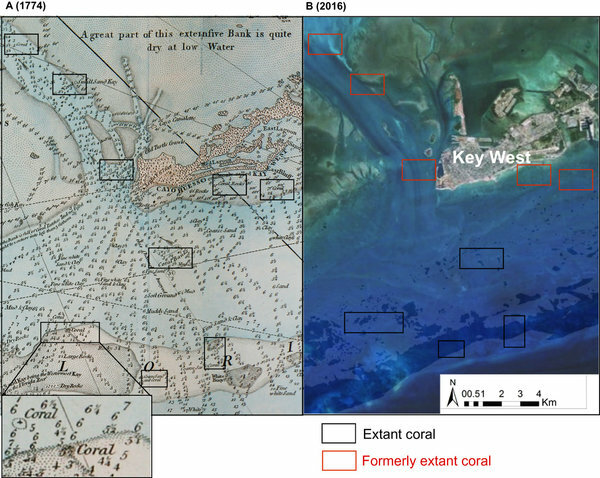 We use high-resolution historical nautical charts to quantify changes to benthic structure over 240 years in the Florida Keys, finding an overall loss of 52% (SE, 6.4%) of the area of the seafloor occupied by corals. 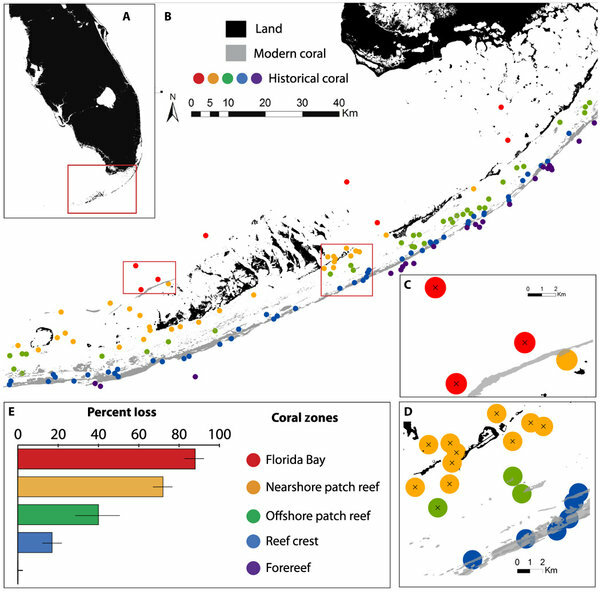 We find a strong spatial dimension to this decline; the spatial extent of coral in Florida Bay and nearshore declined by 87.5% (SE, 7.2%) and 68.8% (SE, 7.5%), respectively, whereas that of offshore areas of coral remained largely intact. These estimates add to finer-scale loss in live coral cover exceeding 90% in some locations in recent decades. The near-complete elimination of the spatial coverage of nearshore coral represents an underappreciated spatial component of the shifting baseline syndrome, with important lessons for other species and ecosystems. That is, modern surveys are typically designed to assess change only within the species’ known, extant range. For species ranging from corals to sea turtles, this approach may overlook spatial loss over longer time frames, resulting in both overly optimistic views of their current conservation status and underestimates of their restoration potential.